Michael Bruh COO Acronym Media Ltd. 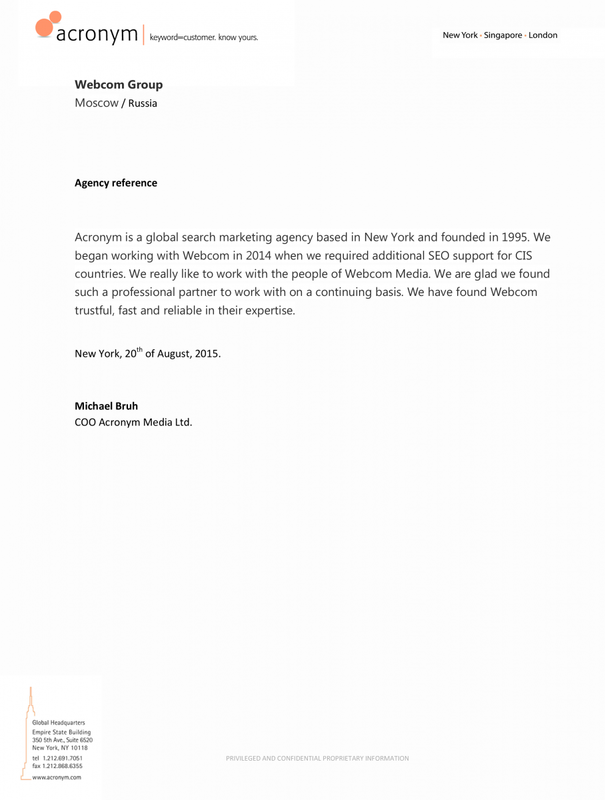 Acronym Media Ltd.
We really like to work with the people of Webcom Media. We are glad we found such a professional partner to work with on a continuing basis. We always recommend Webcom Media to our friends and clients as the right partner. Looking forward to a successful working relationship in the future. This agreement was developed in accordance with the requirements of the current legislation of the Republic of Belarus, Law of the Republic of Belarus No. 455-З of 10.11.2008 "On Information, Informatization and Protection of Information." the use of personal data for sending news to the Company, invitations to events of the Company. At the same time, a citizen has the right to withdraw consent to use personal data by sending a written notification to the Company at 220073, Minsk, ul. Skryganova, 6A, pom. 12. In case of receiving notification of revocation of consent to use personal data, the Company stops processing personal data and destroys the data within 5 (five) working days from the date of receipt of the response. The citizen guarantees that the data contained in the registration form are reliable; when providing information, the current legislation of the Republic of Belarus, legal rights and interests of third parties are not violated. Thanks for your feedback! In the near future, it will be processed by the system and added to the site. In this section are presented testimonials from our clients. Reviews and comments are a great possibility to know the opinion of customers and their experience with our services and company. 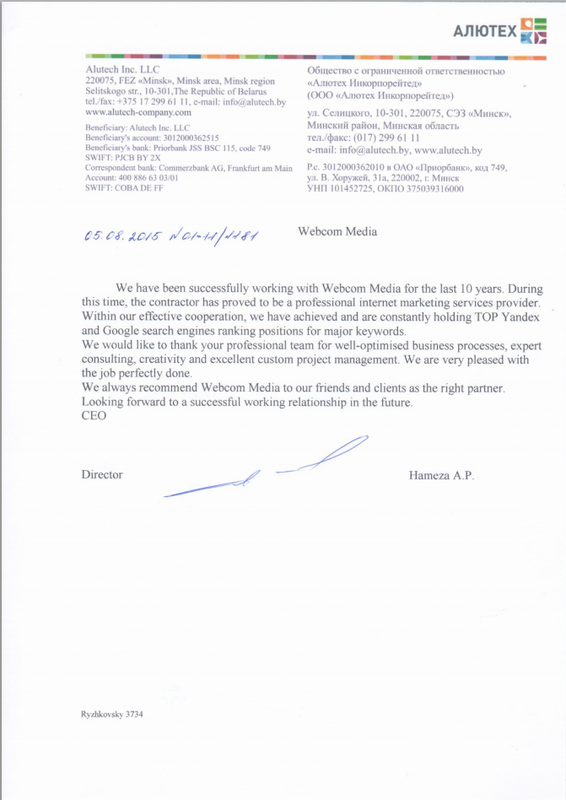 For more than 18 years, Webcom Group has received grateful responses from different businesses: private entrepreneurs, multinational corporations, Internet retailers, and others. We are sure these testimonials will help you to estimate experience and strengths of our company.